Augustana's rich history includes many treasures. Some of these are in use today while others are not but are kept as a remembrance of our past. At some time, possibly after a Sunday morning service, you may want to take the time for a closer look at these treasures. What follows shows and tells a little history of a few of these valuable parts of our past. 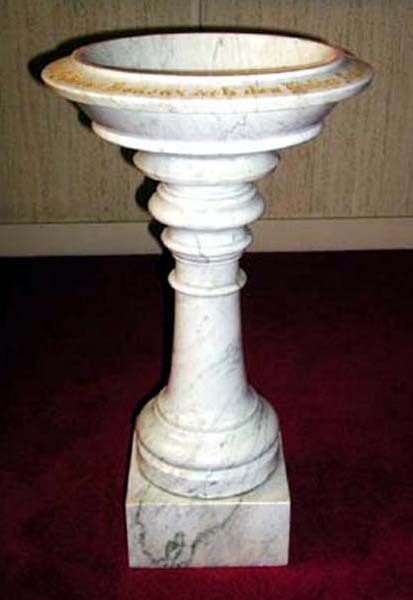 The Baptismal Font, made of marble, is one of the oldest appointments of the church. 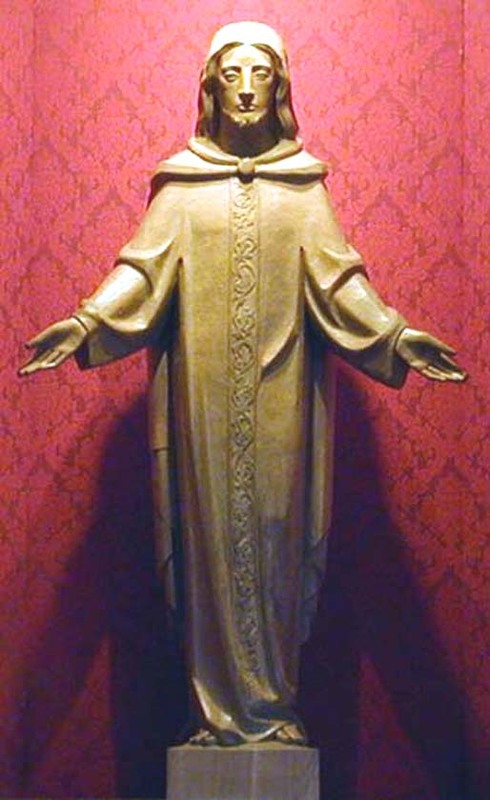 It has been used in the baptism of 2,637 children and adults since 1889. 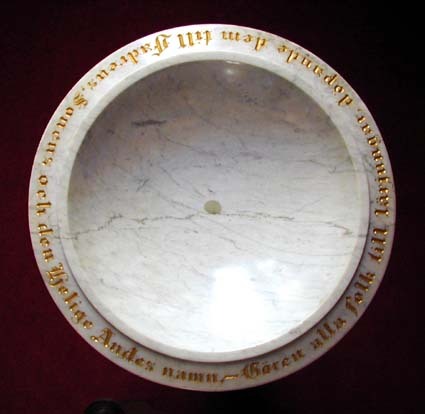 The outer flat rim of the bowl is inscribed in gold letters with the text in Swedish. The translation reads "Make disciples of all peoples baptizing them in the Father's, The Son's, and the Holy Ghost's name". Augustana Lutheran Church's church bell, located high above the ground in the church bell tower, has been used for more than 110 years! This bell was purchased from the Meneely and Company BellFounders of West Troy, New York on May 19, 1892 and tolled its first sounds July 8, 1892. The bell's total cost was $468.82 including freight and it weighed just over one ton at 2002 pounds. 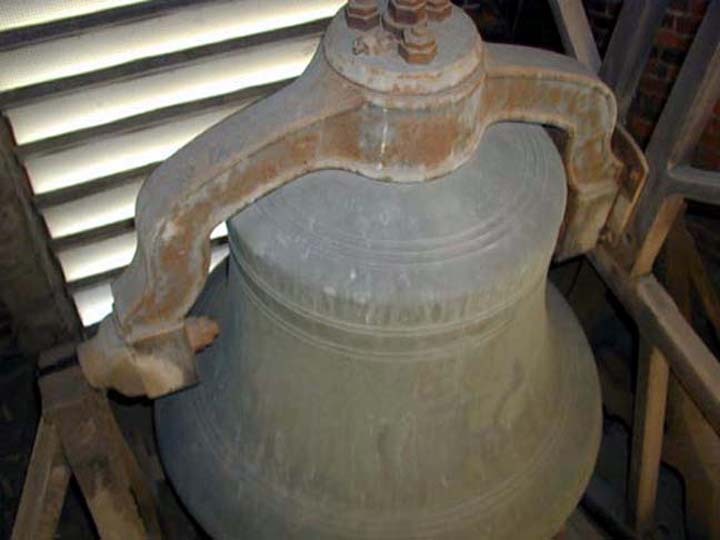 The company's five year warranty assures that "the bell will have bold tone and will not break while being run or tolled in the proper manner". The bell was a gift to the church by the Linnea Society, the older-children's Luther League. Over the years, this ten foot concert Knabe Grand Piano has been used at Augustana for numerous events. 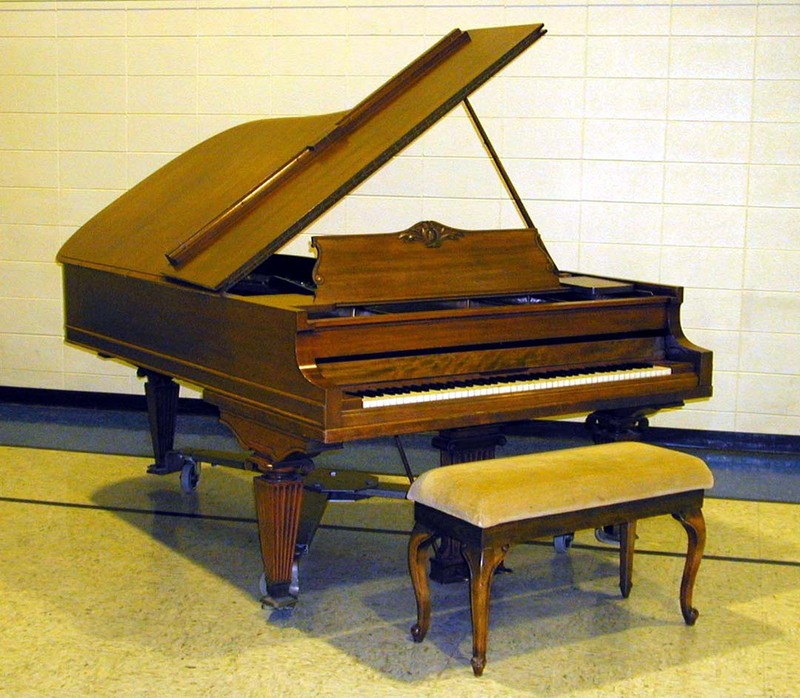 Because of the acoustics, the size of the name and the seating capacity of Augustana untold concerts and recitals were held by local, church and college musicians and choirs using this piano. Many concerts were also given to help with the church's indebtedness as well as for mission programs for the Augustana Synod. The piano was a gift to the church by the Luther League in 1911. The Eucharist Vessels shown here are from 1880 and 1891 and are kept in a glass case in the sacristy. The smaller flagon is dated 1880 and in times past was apparently used often as shown by the wear on the front surface. 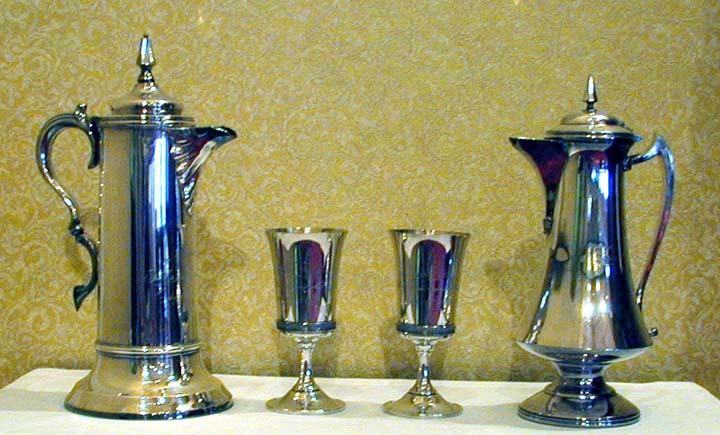 The larger flagon and chalices are dated May 14, 1891. The Eucharist vessels are those we use today for our Sunday communion services. This is one of two identical ornate oak altar chairs which you see in our chancel every Sunday. These chairs have been in continuous use since 1889. This picture shows the one which is behind the pulpit and is used each Sunday by our pastor. In 1980 the two altar chairs were refurbished with red needlepoint and a large gold cross was worked in gold thread in the backs of the chairs. 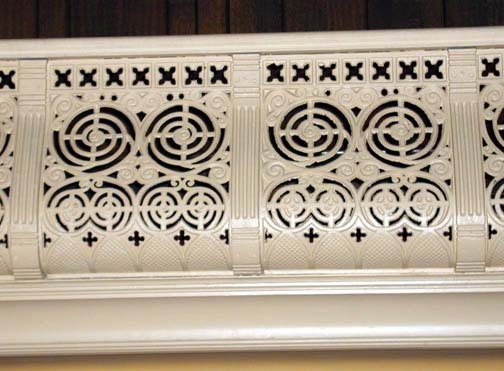 The "Iron Balcony Rail" or "Balustrade" was installed in this church when it was constructed in 1889. Iron was the choice of material since that was what was used in Sweden for many expressions of art work. The rail originally extended around all four sides of the balcony. The iron work at the altar end of the balcony was removed in 1919 when the "Altar of Peace" was installed. The remaining three sides are as you see them today. 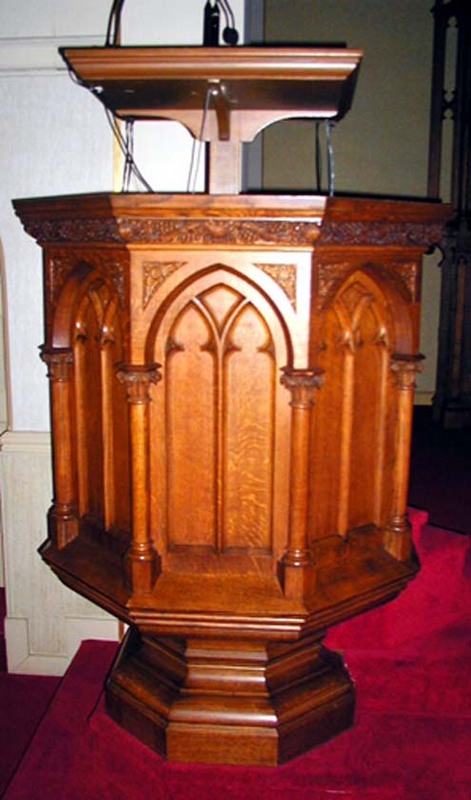 The gothic style pulpit, which is standing in the chancel today, was installed in 1919. The cost of the pulpit at that time was $261.12. Originally it stood ten feet tall and was an imposing fixture. In 1944 the pedestal was cut down to lower the pulpit to five feet nine inches and is as you see it today. For those of you who sat in the very front row, as confirmation classes were required before 1944, you may remember strained necks as you listened and looked up to the pastor as you took sermon notes to be handed in next Sunday. The painting "he is Risen", now on the wall on the right side of the nave, was until 1970 in the center section of the present altar. 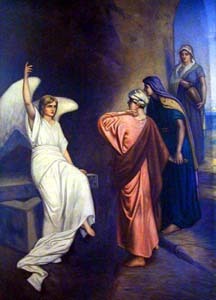 The painting represents the woman at the tomb and the angel with the Easter message "He is not here; He is risen." It was painted by Professor Olog Grafstrom of Augustana College, Rock Island Illinois from an original by Norwegian artist Axel Ender. These statues of John and Moses are in the outer two sections of the "Altar of Peace" which was installed in 1919 during a major renovation to the chancel. The figure of St. John represents the Gospel while that of a stern Moses represents the law. The statues were carved by two German Brothers named Alois and Anton Lang, probably two of the best carvers in the world at that period. Being in America at the time of World War I, they were interned. While being interned they did these beautiful carvings using built-up solid oak to prevent flaking or cracking. The wood is left in its natural color. In 1970 this statue of Christ replaced the painting "He is Risen" in the center section of the "Altar of Peace." The statue was carved in Slovenian oak by Henrich Marider Does of Italy. Other changes in the chancel area made in 1970 were the addition of a free standing altar table, two credence tables, acolyte stools and a new communion rail.